Last week I told how I rubbed off a pattern from a vintage rayon dress I found at Red Fox Vintage store in Woodstock, Portland. The rub-off is a collection of muslin pieces, which doesn't include seam allowances but does show all the seamlines and the places where they intersect. It's the start of a pattern! Today I'll show you some more of the process. I picked two fabrics to test the garment, and used the rub-off pieces as pattern pieces, adding seam allowances as I cut. I'm calling this project my "Red Fox Vintage" dress because I bought the original dress at Red Fox Vintage in Woodstock, Portland. I tried it on because I was intrigued by the collar, which has two long lapels that criss-cross in front and are held by a buttoned-down tab. I found it fit perfectly, and I loved the silhouette (late forties, early fifties is my guess), but not the color. Still, I brought it home, because it fit my back in a way that I have a lot of trouble getting patterns to fit my back. (I'm high-waisted with a slightly forward shoulder). My friend Eryn (remember her?) learns in much the same way I do: starting with a vision beyond her ability to achieve, then jumping in way over her head, learning along the way, and achieving something she's proud of even if it's not the vision she started with. And, like me, she is a woman who speaks with her clothes, so it's no surprise if the dress options at the store failed to impress her this year when she wanted a gown for a Christmas charity event. She came to me with a vision: a gown with old Hollywood glamor, with batwing sleeves, V-neck front and back, and a fitted torso. I said I'd help, but she would do the work, and our deal was struck! Like most frugal people, my family was green before it was cool. Every Christmas, we re-used wrapping paper from previous Christmases (no ripping or tearing allowed!) or used the colorful Sunday comics from the newspaper. This year, as everyone seems to be ordering from Amazon, I see lots of the Amazon gift bags under the tree, which are some sort of outerwear-type chemical fabric covered with sparkly polyester organza. Naturally, I'm saving them for next year, too! Meanwhile, finding in my stash a bit of printed cotton with wise men on it (a Christmas print I actually like), I decide to make my own re-usable Christmas wrapping! In which I make a Victorian-inspired plastron or dickie... and end up looking like I work at Grace Brothers! A "plastron" is a chest covering. If you're a turtle, it's your shell. If you're a fencer, it's your padded vest. If you're a Victorian era lady, it's a lacy faux-front that you tie around your neck to change up the look of your dress. And if you're me... well. Read on to see what I came up with! Here's how I typically layer up when I'm cold! Remember this picture? Besides my nightcap, I'm wearing a yellow quilted bed jacket given to me by a friend. 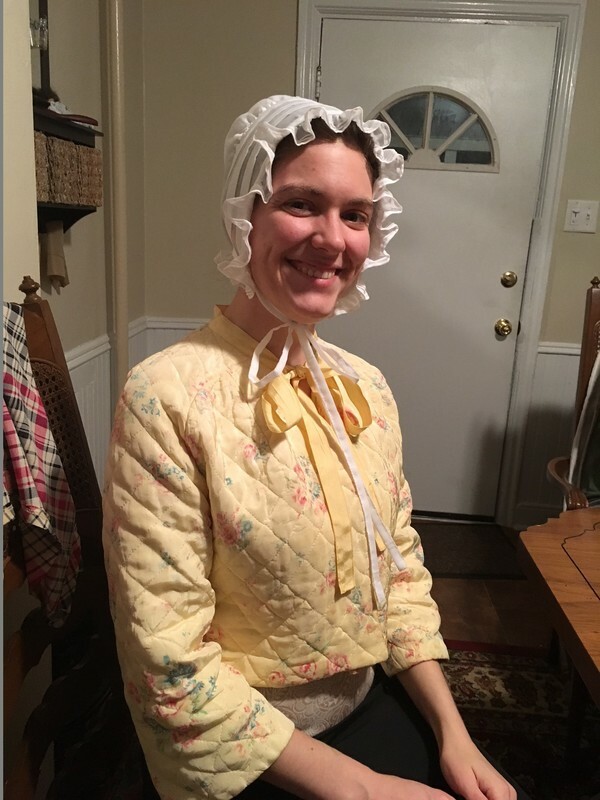 Bed jackets used to be a thing, before central heating became the norm, and they are really useful for lounging around if, like me, you're chronically chilly! Mine is probably from the fifties or sixties. It's made of some sort of loud synthetic (loud as in it scratches and rustles against itself like taffeta or cheap acetate). It being older than me to start with, it didn't stand up to more than two years of my use and occasional washing; the batting went flat and various spots wore away and shredded. So I decide to take a pattern from it and make new! When I told my six year old niece I would make her a hat, and asked what color she wanted, she answered: "Teal and sparkly pink!" Well, I found sparkly teal and pink, so I decided--close enough--and set out to make the hat with them. I picked up a Maw-Bell pattern from Fabric Depot a while back, during their warehouse sale. It has a plaid skirt and hat in it, but I was just interested in the adorable hat. As it turns out, it's a super simple pattern! A seamstress friend from my Steampunk days referred this bride to me back in November 2017, when she found her own plate too full. G. came with dress pattern, her chosen fabric, and even a muslin made up by my friend. I finished the dress for her by the new year, but am only posting now, after the wedding! The pattern is McCall's 9133, and it's view A that she wanted. She chose electric blue satin for the dress, and white lace for the overdress with sleeves. In particular, because she's a practical woman, she requested that the two layers be made entirely separate, so she could shorten the blue dress later and wear it to other events. For notions, I bought a blue invisible zipper, white loops & buttons, and horsehair brain for the hem.